Citizens’ Initiative is a direct democratic procedure to both set agendas and to make decisions on the kind of substantive issues that have been aired here in MacGill over the years. These constitutionally based procedures enable people to exercise their democratic power directly by triggering referendums. Getting a proposal to the ballot requires support of a sufficient number of voters, which must be got within a specific time frame. This support has to be validated, as does the actual proposal. The whole electorate votes on the proposal, following consideration by the legislature. If the legislature enacts measures to resolve the issue to the satisfaction of the proposers, then there is no vote. A well-designed citizens’ initiative is complementary to representative democracy, because of the facility for the existing legislature to make a counter proposal. I talk about that later. Modern direct democracy has many forms in the countries in which it is used. Whether we look to Boston or Berlin for inspiration, citizens’ initiative is a major element of how people govern themselves in those places. Before I outline how this works in Switzerland, Germany and the US, I want to describe how we govern ourselves. In elections, we transfer this power to our TDs and through them to the organs of state. Elections are the means we use to make decisions on persons to whom we transfer our power for periods of up to five years. Once done, we have to wait for the next occasion to use our power. Note there is no separation of powers between the Dáil as legislature and the Government as executive. This makes one think of Montesquieu’s observation Where the legislative and executive powers are united in the same person, there can be no liberty. Citizens’ initiatives gives people a right and the means to participate directly in political activity without waiting for elections. It serves as both an accelerator and a brake on the activities of politicians, parliamentarians, political parties and policy-makers – independently of the Dáil and Government timetables. When I mention brake, some of you may wonder if I favour the recall election, which is how Arnie Schwarzenegger first became Governor of California. A recall election is when citizens using the initiative process to force a holder of public office to face a vote on continuance in that office without waiting for the next election. Let me say straight away that I do not favour recall elections as long as we have PR-STV in multi seat constituencies with constituency boundaries being set independently. I now will outline how citizens’ initiatives work in three countries, Switzerland, Germany and the USA. 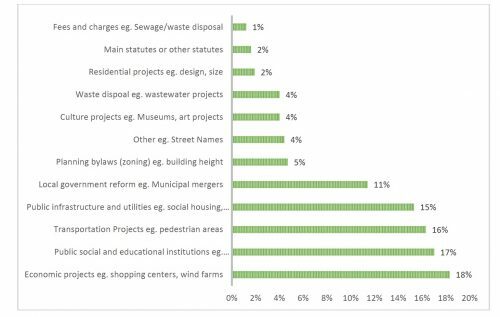 Citizens’ initiatives are most identified with Switzerland. It is a deeply divided country of 8m people, – with four languages, two major religious groups, at least two major cultures defined popularly by cuisine, a high standard of living in a resource poor country, political power very decentralised among the 26 cantons which have populations varying from 16,000 to 1.4m. As an example of a citizens’ initiative at Federal Level, let me tell you about Thomas Minder. He is a Swiss businessman who found it completely unacceptable that senior management of Swissair walked away with golden parachutes, when Swissair collapsed in October 2001. His company was a supplier to Swissair and lost business. In October 2006, he started a Popular Initiative, as the Swiss call it, to have clauses inserted in the Swiss Federal constitution governing the setting of total remuneration packages of senior executives in Swiss companies listed on stock exchanges. By February 2008, he had over 100,000 signatures (about 2% of the 5m Swiss electorate) – the number needed to launch a referendum to amend the Constitution. In March 2013, his fellow citizens approved his proposal.x Yes, it took over 6 years. While not a quick fix, it was effective. – the third to actually persuade a majority of the ~5m electorate in addition to ensuring a majority in most of the Cantons. During the past two years, there were two other people-initiated referendums on pay. One was on limiting top salaries to not more than 12 times that of the lowest paid. The other was on setting a high minimum wage. The voters rejected both. In Switzerland, there have been just over 600 referendums at Federal level since this was adopted in 1848 after a civil war between Catholic and Protestant cantons. Since the end of WW2, the 16 German Länder have brought in citizens’ initiatives at the Länder levels and at more local levels. Bavaria was the first Land to do so in 1946, as the first post WW2 Premier of it had spent 11 years in Switzerland during the Nazi era. The processes differ in each Land. Since WW2, there have been over 400 referendums in Länder level (including 10 in the immediate aftermath of WW2). Three quarters of these have been initiated by citizens. Nearly 90% have taken place after German reunification in 1989. In 2011, in a referendum, Berliners voted in favour of the publication of the secret contract regulating the sale of the municipal water company to Veolia and RWE. In 2013, voters in Hamburg to buy the electricity, district heating and gas grids back from two multinationals. This was the end of a campaign based on a citizen’s initiative, based on 60,000 signatures ie. 5% of the 1.2m voters. In January 2014, the city of Hamburg agreed to purchase the energy grid from Vattenfall for between 495 and 550 million Euros (690 – 765 million USD). Talks to purchase the gas and district-heating infrastructure are still underway, with a preliminary purchase price of between 1.25-1.45 billion Euros (1.75-2 billion USD) being discussed when contracts expire in 2018 and 2019 respectively. In Bavaria, there were nearly 1400 initiatives at the levels of the 2,000 towns, cities and smaller communities in addition to the Land itself, in the 10-year period 1995-2005. The broad thrust of these are shown in Figure 5: Bavaria, Aims of citizens’ initiatives and council submissions 1995 -2005. 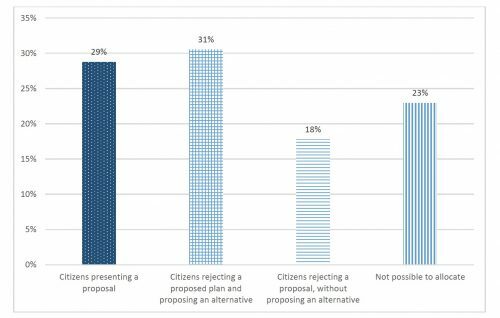 Nearly 60% were citizens initiating definite proposals. Nearly 50% of initiatives were rejections of some measure. 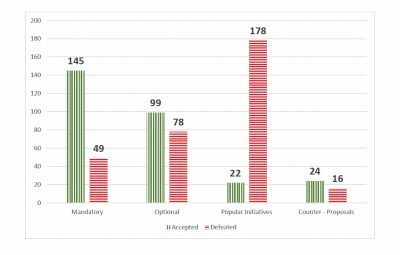 Less than 20% were outright rejections without any alternative being proposed. 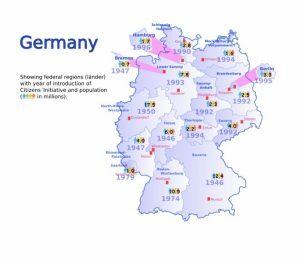 At the next level below the Länder, the cities, towns and districts, there have been nearly 6,500 direct democracy proceedings on substantive issues between 19556 and 2013. These votes are decisive, not simply consultative. Over 80% of these arose from the collection of citizens’ signatures, with the balance initiated by the local authorities. 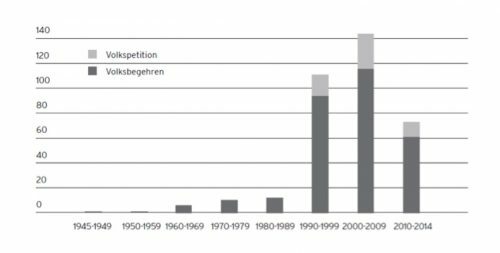 The range of issues raised in these is summarized in Figure 6: German Länder Issues raised in direct democratic procedures 1956 – 2013. In the US, twenty four states direct democracy as do thousands of cities and other local governments. 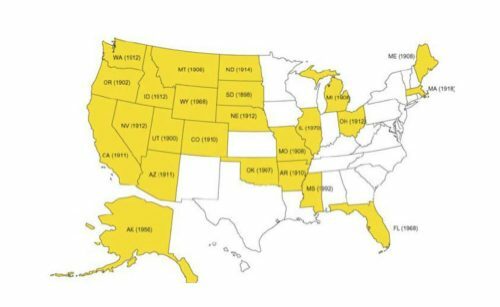 Figure 7: USA States with Direct Democracy procedures (year adopted). Of these states, 18 provide for citizen initiated amendments to the state constitution. In the period 1900-2012, there have been just under 2,500 citizen initiatives at state level. 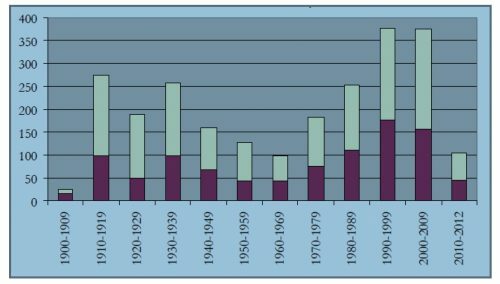 Of these, just over 40% have been approved – see Figure 8: USA Direct Democracy Initiatives (adopted) at state level 1900 – 2012. Many people are aware of citizens’ initiative because of the impact of California’s Proposition 13 adopted in 1978. This changed property taxes and also amended the Californian Constitution to make it very difficult to change those taxes. It also led to a revival of the use of initiatives across the US. In the 1970s, there was high inflation in California. This led to house price increases and thus rises in property taxes. Neither the Legislative or Executive sides of Californian Government responded to this increase in taxation by stealth. Using the initiative process meant people were able to take the law into their own hands, without violence. However, the Californian constitution does not allow for a counter proposal. For citizen initiated constitutional amendments, the petitioners (As they are called in the US) have to collect signatures equal to 8% of the most recent gubernatorial election. In 1978, that came to nearly 500,000 signatures from an electorate of 10m in a population then of 23m. These have to be gathered within 180 days. Today that would amount to just over 585,000 in a population of 37m. to place a statute or a veto referendum on the ballot, the signatures of 5% of the electorate are needed. Proposition 13 did not apply to income or sales taxes, which are the major sources of state revenue. It also led to a revival of the use of initiatives across the US. There are many issues which Citizens’ Initiative raises. e.g. 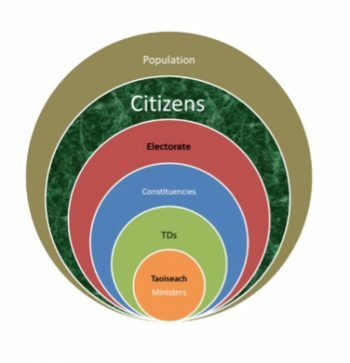 Citizens’ Initiative supplants TDs and the Dáil. In referendums, people may not vote on the issue, but on the government. We already face these in our politics. I will make a few comments on some of these. This direct participation by citizens between elections is complementary to representative democracy, not a replacement for it. 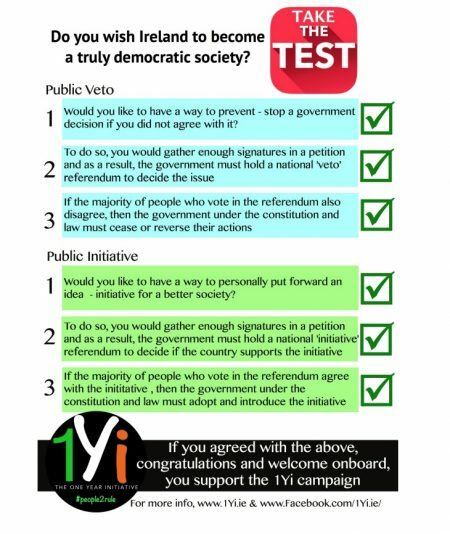 Modern forms of direct democracy would give the Dáil should have the right to put a counter-proposal to the people at the same time as any citizen initiated proposal. In Switzerland, If the citizens’ proposal is not withdrawn, both must be voted on at the same time. The counter-proposal is accepted in 60% of cases. There are constitutional provisions setting out how the outcomes will be decided, should there a tie. With this in place, there is no threat to either the Dáil as a legislative assembly or to TDs. They will still have to do well over 90% of the policy-making and legislation. But, in certain cases, having a by-pass improves life in our bodies and our towns. Why not our legislature? Experience in Switzerland and in Germany, is that a counter-proposal can lead to an agreement such that a referendum is not needed, as the proposers and the existing authorities reach sufficient agreement. In Hamburg, this happened with proposals for changes to the electoral system used for Länder elections. One common objection to referendums in general is some people think that voters do not vote on the issue, but on the government of the day. The referendum vote has nothing to do with the issue. This is inevitable if Government is the sole source of proposals on which referendums are called. At present, that is the only practical way that referendums can take place under our 1937 Constitution. If there were other sources of referendums, it would be less likely that every referendum was regarded as a test of government popularity. Of course, referendums cost money. But when you see a large number of TDs say that they will not comply with the law, can we continue to take the legitimacy of our way of governing ourselves for granted? Well legitimated decisions are easier to implement. To illustrate how citizens’ initiative could have been useful, consider Corrib gas terminal issue in Mayo and Irish Water. If there had been citizens’ initiative in Mayo, a vote on the issue could have created an opportunity to discuss the pros and cons of the project over a longer timeframe than the 5-week period for submissions on planning applications. Issues would have emerged and been teased out. Emotions would still run high, but a longer timeframe would have allowed for a better understanding of all aspects of the project. There would have been clarity for all concerned much earlier on. I suggest that community severance, general aggravation and other costs would have been less. Similarly with Irish Water. A lot of people simply do not agree with the setting up of Irish Water – some because they believe that treated water should be paid for from general taxation, others because of cack-handed way the whole thing was developed and implemented. In fact, one by-products of Irish Water is the One Year Initiative 1YI campaign – the aim of which is to have a referendum to decide on whether we want to embed people-initiated referendums in our constitution. Providence never intended to make the management of public affairs a mystery to be comprehended by a few persons of sublime genius. Although only a few may originate a policy, we can all judge it. Check and balances should prevent the powerful from exploiting people, from abusing their position, gross bad management, minimising the scope for corruption and be effective on all those issues, together with white-collar crime. But in our representative democracy these mechanisms remain under the control of the established politicians and others with power and influence. As we well know, this kind of self-control only works within certain limits. Citizens’ initiative is an auxiliary precaution to ensure that the development and implementation of checks and balances is not confined to those who are most likely to be subjects of such checks and balances. In moving the adoption of this Article, I may say it will still further associate the people with the forging of the laws of the country, and it puts the power in the hands of the people of even initiating legislation. If a large section of the people feel that a certain law is desirable; and if Parliament fails to introduce the desired legislation, power is given here to the people to initiate legislation themselves. It is the direct complement of the Referendum, and pretty much what can be claimed for the Referendum can be claimed for the Initiative—that it keeps contact between the people and their laws, and keeps responsibility and consciousness in the minds of the people that they are the real and ultimate rulers of the country. As we continue through this decade of centenaries, we can reach further than a simple harking back to an era in Europe that glorified war and made a cult of violence. xvii We also have a tradition of successful political action based on monster meetings, precursors of citizens’ initiatives leading to referendums. We need to shift the dysfunctional governance paradigm from a mindset that grants liberties to subjects to one based on the rights of the citizen to exercise power directly. With two major social, fiscal and economic crises in the last 40 years, our way of governing ourselves leaves a lot to be desired as this MacGill Summer School has heard for years. We are victims of our failures and our successes. We will not change outcomes without changing our approach to how we use our power to enhance our way of governing ourselves. We need the impetus that a carefully designed and well-implemented citizens’ initiative would bring to using our power for our common good, democratically. i Recently, Richard Boyle and Muiris MacCarthaigh suggested that changes made had not gone far enough. lrish meltdown was world’s worst since 1930s – IMF report Irish Independent 28 June 2012 http://www.independent.ie/business/irish/irish-meltdown-was-worlds-worst-since-1930s-imf-report-26869930.html report on IMF Research Department Working Paper WP/12/163 Systemic Banking Crises Database: An Update Luc Laeven and Fabián Valencia. iv The experience of being elected to Dáil Éireann for the first time is quite a shock to the system. My judgement put succinctly is this: Dáil Éireann, which is the very heart of democracy, is at heart a failure. Dáil Éireann isn’t working’ it is failing the people. As a legislature, it is hopelessly inadequate and slow; as a forum for debate it is irrelevant in many respects; as an organ of the popular will, it is atrophied and increasingly non-functioning. v It has been pointed out that while the civil service has traditionally recruited the cream of the country’s talent, not enough effort was made at institutional level to exploit the full potential of that excellence. My experience as a Minister bears this out… The Government has a duty to facilitate Irish policy-making and implementation. It is true that many of the problems affecting our society at present – reflecting the trend across Europe – stem from our failure to carry through decisions on institutional modernisation. In turn, this is often the result of over-reliance on modes of thinking – which have become obsolete. MacSharry, Ray TD MEP. “The White Paper ‘Serving the Country Better – a step in the right direction.” Seirbhís Phoiblí (Department of Finance) 7, no. 1 (March 1986): 3-6.
vi What is abundantly clear is that we are ill-prepared nationally for the reorganisation of society and of economics on which we are required to embark as a condition of survival. What we need is not necessarily a radical or total transformation of our society but rather an interim strategy that will get us on our way. If the Taoiseach must resign if (s)he ceases to hold a majority in the Dáil (Art. 28.10), in which case the Government is deemed to have resigned. ix The Bertelsmann Stiftung published a report on Sustainable Government Indicators for the period 2005-2007. This found that Ireland ranked third from the bottom of 31 OECD legislatures according to structures and resources of parliament. Dr. Muiris MacCarthaigh said of this finding: It is clear that the Irish parliament tends not be one which stands out as a strong legislature in international comparisons, and it is difficult to escape its dominant characterisation as a parliament substantially subjected to the prerogative of the executive. Persons violating the provisions under letters a-c are liable to a custodial sentence not exceeding three years and to a monetary penalty not exceeding six times their annual remuneration. Note that English is not an official language of the Swiss Confederation. This translation is provided for information purposes only and has no legal force. There may be change in the criteria of decision-making at the top; change in social habits at the bottom. But unless these two are bridged by the mutual education of the democratic process, communication between the top and the bottom may cease. In Ireland, where the stimulus to change is external, something like this may in fact be happening. But if decision-makers respond more quickly to the challenge of change than the masses, the continuing vitality of democracy turns essentially upon their capacity to communicate their convictions to society. If these new convictions are not sufficiently strongly held and rationally understood in the key areas of party political power and administrative authority, or if the mass of people, largely deprived of secondary, technical, and university education and congenitally sceptical of their political masters, turns a jaundiced ear to the new rhetoric, democracy in that society…wanes in political apathy. If the study of change in Ireland over the last fifteen years adduces evidence of a single pitfall, it is surely that. It is not enough for leaders to know what to do and have the courage to do it. They must be able to persuade the electorate of the necessity of what they are doing. This, if anywhere, is where leadership that is otherwise good has failed in Ireland. This observation is as relevant today as it was 50 years ago, even if we take account of more widespread education in the intervening period. We face challenges similar to those of the 1960s arising from significant changes to patterns of trade (eg. then the Anglo‐Irish Free Trade Agreement, now the rise of China) with the resultant pressures on resources. This challenge is all the more demanding because of the social and economic effects of extraordinary property/building speculation funded by incompetent banking coupled with a lack of checks and balances in government. We now have completely new information and communications technologies readily available to us. Our political/administrative/trade union/financial/business leaders have no excuse for overlooking the constraints of being a member of a currency union. For much of our history since independence, we were in a currency union with Britain as is Northern Ireland still. This had pros and cons, as does being a €urozone member. We are now paying the price for the belief that we could build a common prosperity by an over reliance on non-traded (internationally) activities eg. land rezoning, property development funding by banks using short term borrowings, construction, associated state revenues etc. This follows a similar bad judgement during the 1970s, when our Governments started to borrow heavily for day-to-day spending. This led to the 1980s social and economic crisis. xvi In 2010, the Swiss President Doris Leuthard wrote that No fair and decent globalization without direct democracy ……”Democracy is hard work – sweat and often uncomfortable confrontation…..democracy lives in “the conflict of interests and opinion – but also in the wisdom to recognise the limitations of this conflict….Democracy is never easy – especially in an increasingly globalised world, in which state borders become more and more porous, where commerce and trade are possible everywhere and the exchange of goods can be carried out at any time. Nowadays – with few exceptions – and thanks to the latest electronic communications technology, doubt, distrust and criticism of government decisions can be viewed and downloaded by anyone anywhere in the world around the clock. The result is that Modern Direct Democracy as a necessary part of representative democracy is forced to engage more strongly than ever before in arguing is case – in convincing people of its merits – and in the perpetual search for compromise….. In our country democracy is not “the rule of the politician” as defined by Joseph A. Schumpeter. In Switzerland there is a direct trade-off and active participation in shaping policy between the political establishment and the voters via the right of initiative. Here the initiative and referendum process has become a direct political feedback loop.